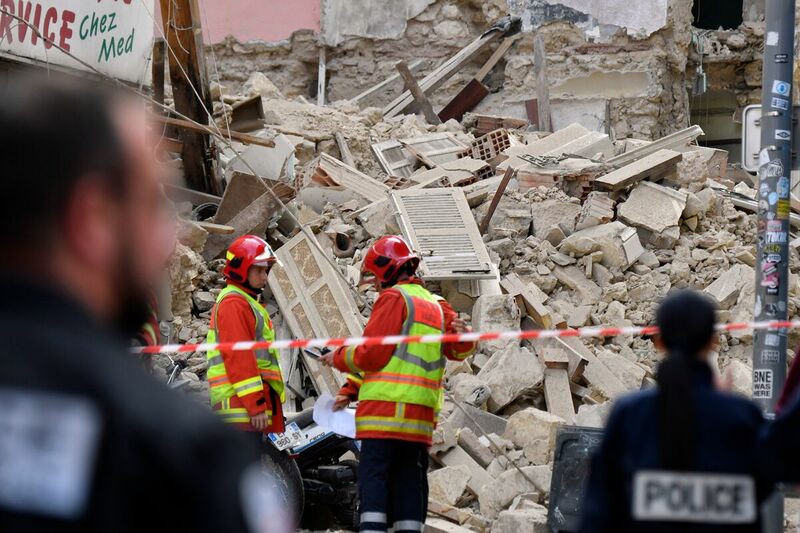 6 Bodies Found After Apartment Buildings Collapse In Marseille, France A woman who lived in one of the buildings said she stayed with her parents the night before the collapse because many of the doors in her building wouldn't close. "It could have been me," she said. A gap now exists where two buildings collapsed on Monday morning in Marseille, France. A third building was damaged and also torn down. Rescue teams are searching for survivors amid rubble after two buildings collapsed in Marseille, France, on Monday morning. So far, the bodies of four men and two women have been found, Reuters reports. Authorities initially said there may be up to to eight victims. "The searchers have found some survival pockets so there is perhaps hope there may be people still alive," French Interior Minister Christophe Castaner said, according to The Guardian. One of the buildings, 63 rue d'Aubagne, was condemned, but local officials could not rule out that squatters might have been living there. People were living in the other building that collapsed, 65 rue d'Aubagne. Sophie Dorbeaux, a 25-year-old philosophy student, was one of them. She told AFP that she had stayed with her parents the night before the collapse because many of the doors in the building would not close. "It could have been me," she said. The news service reports that nine of that building's 10 units were occupied, with a shop filling the lower level. An adjoining third building, number 67, sustained damage and was torn down for fear it would collapse, as well. Firefighters and police work at the site near Marseille's Old Port where two buildings collapsed on Monday. Castaner said inspectors had visited number 65 on Oct. 18, and were concerned but did not see cause to evacuate. "The risk is that it's a house of cards. It was a dilapidated building but there were owners and tenants there. 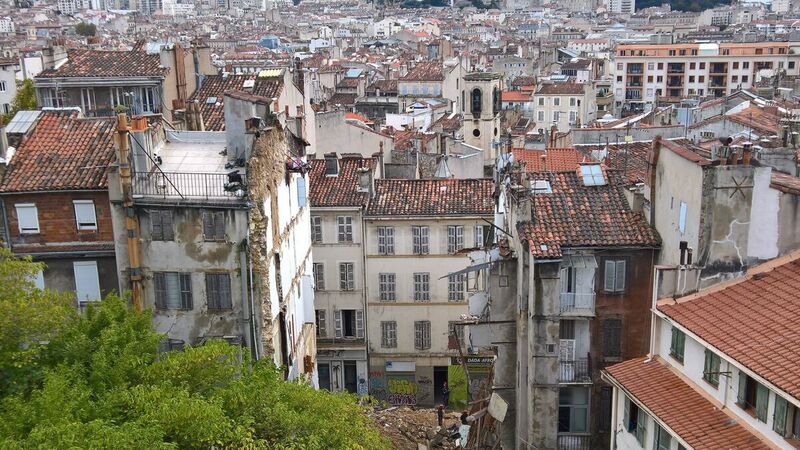 It wasn't a slum," Renaud Muselier, the president of the Provence-Alpes-Côte d'Azur region, told the Guardian. Images taken in July for Google Street View show number 63 with a dilapidated façade and boarded-up windows. Number 65 appears to be in somewhat better condition. 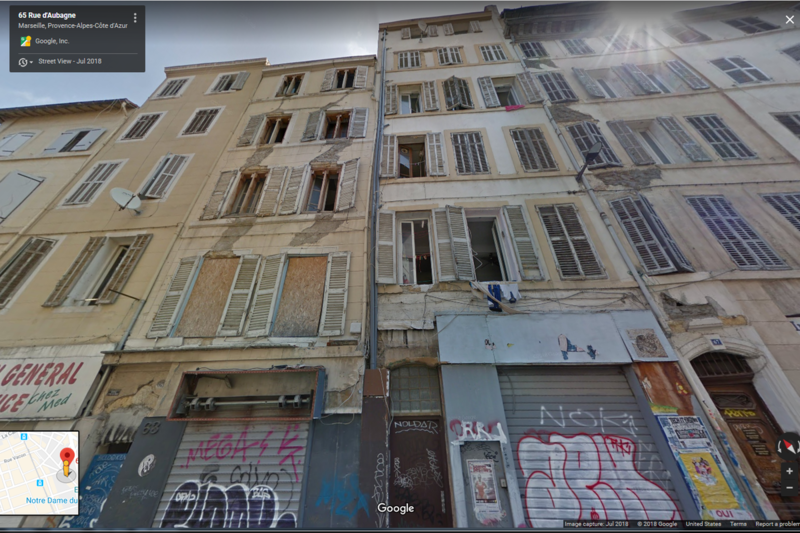 Images taken by Google in July show the dilapidated facades of 63 and 65 rue d'Aubagne, which collapsed Monday. The collapse occurred near the city's Old Port, a bustling area full of aged buildings. A 2015 report by the government found that 100,000 residents of Marseille "were living in housing that was dangerous to their health or security," according to AFP. France's interior minister called for patience before assigning blame. "This is not the time for controversy," Castaner wrote on Twitter. "The urgency is the clearing and the rescue: all our energy is dedicated to it. The time of the investigation will come." City officials have evacuated more than 100 nearby buildings following the collapse, which authorities believe may have been caused by heavy rains, AFP reports.